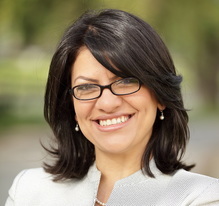 Rashida Tlaib was raised in Detroit and is the child of immigrants, who taught her the importance of hard work, honesty and commitment to community. Rashida received her bachelor's in political science from Wayne State University in 1998. While working full-time, she attended weekend classes at Thomas Cooley Law School, where she earned her law degree in January 2004. As the eldest of 14 children, she developed leadership qualities that made her responsible, caring and compassionate. Her family’s struggle to create a new life in Detroit inspired Rashida’s long-term commitment to public service and giving back to the community. Rashida made history by becoming Michigan’s first female Muslim legislator when she was elected to the Michigan House of Representatives in 2008, where she quickly became a leader amongst her peers. Rashida was appointed as the Democratic Vice Chairwoman of the Appropriation Committee, where she serves as the Democratic Vice Chairwoman of the House Fiscal Governing Committee, Department of Human Services, and Department of Community Health Subcommittees. While participating in these valuable committees, she has worked on more than 30 bills combatting poverty, increasing access to human services, protecting our public health and environment, and promoting public safety and consumer protection. Rashida has been married to her husband, Fayez, for 15 years. Together they have two sons, Adam and Yousif.